The Israeli ambassador has said he has had a warm reception in Wales, despite a call by a senior assembly member for AMs to boycott a meeting with him. 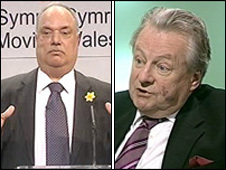 Presiding Officer Lord Dafydd Elis-Thomas said he objected to Israel's "failure to meet its international obligations" towards the Palestinians. 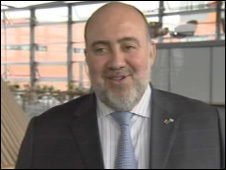 The ambassador Ron Prosor said the boycott call did not make sense but his welcome had been "wonderful". 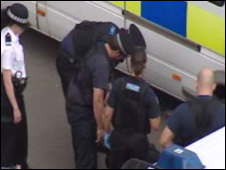 Two women and one man were arrested after a minor disturbance outside. The ambassador met party leaders in Cardiff Bay and is attending a private meeting with around 15 assembly members organised by Wales' only Muslim AM Mohammad Asghar. Mr Prosor said he had enjoyed "a wonderful reception from the people of Wales and also from people here at the national assembly". Asked what he made of the boycott call he said: "The good lord, although a lord, not everything that he said is very noble. "Especially at the national assembly, here in Wales, I'm sure that people are not following his call and I'm being treated very very nicely." "We conduct an open debate and I don't mind criticism of the only democracy in the Middle East." He insisted that Lord Elis-Thomas's protest did not makes sense for "someone who is in a national assembly, in a parliament, which comes from 'parler' - from talking to each other". Meanwhile, is understood some pro-Palestinian protestors tried to get into the rear of the assembly's Ty Howell building in Cardiff Bay during the afternoon. Earlier, Welsh Assembly Government Minister Jane Davidson confirmed she would not be attending the reception for the ambassador, insisting it was "a choice for assembly members" individually. She said she had always been "very supportive personally of the need to recognise Palestine fully". Ms Davidson said it was "entirely appropriate" for First Minister Rhodri Morgan to meet the ambassador, "just as he would meet representatives of any country". Mohammed Asghar, who represents South Wales East, invited his assembly colleagues to the confidential meeting saying he wanted to promote inter-faith dialogue. But Lord Elis-Thomas e-mailed AMs calling on them to refuse to attend. In the e-mail, he said: "I am unwilling to accept the invitation to meet the ambassador because of my objection to the failure of the state of Israel to meet its international obligations to the Palestinian people of the Holy Lands. I would invite other colleagues to do the same."